So where do we go from here? Where will the second half of Season 8 lead us? Well, as someone who refuses to read anything even resembling a spoiler, I can't say for sure. I find that I just don't enjoy TV when I know what's going to happen. Half the fun is the element of surprise. So what I will share with you next are my theories and wishes for the remainder of Season 8. At the end of "Legion," it wasn't clear whether or not Chloe's healing ability was back. Personally, I think it could be. It's possible that BrainIAC merely suppressed her ability rather than totally removing it. Now, since that lovable Interactive Construct has been removed, it's entirely possible that Chloe will once again find herself able to heal. Another valid argument states that BrainIAC sucked the healing ability out of Chloe during their face-off in "Arctic." I could really see this going either way, but for now, I'm going to say that her healing powers could very well have been restored. Clark will battle Doomsday. I just hope it isn't a battle to the death. Clark ahs died several times already, including once this season. I would prefer to see an epic battle in the streets of Metropolis, similar to the one in The Death of Superman. How amazing would it be to see Doomsday beat Clark to a bloody pulp and then endanger one of his loved ones (preferably Lois), pushing Clark over the edge and giving him a second wind? Clark could begin pounding on Doomsday, burying him deep underground in an effort to prevent such a distaster from ever happening again. This would set things up perfectly for the future as laid out by DC Comics. Also, Clark should continue his steady path towards Supermandom. The next step I think he needs to take is to acquire a pair of glasses, something that should have been done in Season 3 when he found himself temporary blinded after using his heat vision on a pair of green Kryptonite earrings. That would have been the perfect excuse for Clark to don spectacles, but alas, it was not meant to be. Yet. Now could be a good time for him to pick up a pair of bifocals to remove any suspicion that he might be Metropolis's "Red and Blue Blur." Lois has been falling for Clark pretty hard. I think the romance has been progressing a little too fast. Erica Durance isn't supposed to appear in the next couple of episodes, so maybe things will cool off for a while. I am glad to see the most iconic romance in comic book history beginning to take shape. I just don't want them to actually be together until after the series has ended, or at the very end of the series at the earliest. Jimmy, while injured and receiving care in Star City, will clearly turn out fine. The question looming in my mind is how the Olsen-Sullivan marriage will pan out. How is it that the Legion had heard of "even Jimmy Olsen," but had never heard of his wife Chloe? It seems a bit odd to me. That is a sign that the marriage may not last, whether it's due to irreconcilable differences or a death. As much as I hate to admit it, there is also the slight possibility that Geoff Johns may have written the show into a plot hole, but let's change the subject, shall we? There has been some speculation that Davis Bloome is no more and Doomsday is here to stay. That seems silly. Why hire Sam Witwer and make him a season regular only to have him in a monster costume the entire second half of the season? Doesn't make sense. I think it's safe to say that we'll be seeing more of Davis in human form. After "Bride" and "Legion," he clearly knows what he's become. From this point on, we'll probably see him trying to deal with his other half. Will it be a situation where his good side tries to fight his bad side? If so, will the good side win for now? Or will they go a different route and show his good side succomb to the dark side, as with Anakin Skywalker in Revenge of the Sith? Perhaps Davis will be so distraught by some traumatic turn of events (like Chloe's rejection) that he will embrace evil as a means of revenge? We shall see. There are many different directions they can take this character and I'm eager to see where things end up. Well, my distinguished readers, this is all I have to say about Smallville's Eighth Season for the moment. I'm sure there are a great many things that I have neglected to mention, but that is where you can step in. Discuss whatever I failed to mention in the comments below and perhaps I'll write a supplemental post. 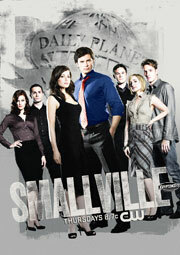 Let's talk Smallville!